If (like me) you are keeping up to speed with Microsoft's ASP.NET Web API framework you might have noticed the recent release of the ASP.NET and Web Tools 2012.2 Update. What was exciting for me in this release was the addition of an automatically generated help page which can be configured to use comments in your code for the documentation. What better way to maintain the documentation for a web service than in the code itself? Although the display of the default help page is pretty comprehensive from the start, I wanted to change the way it grouped items to better suit my implementation of a REST service. 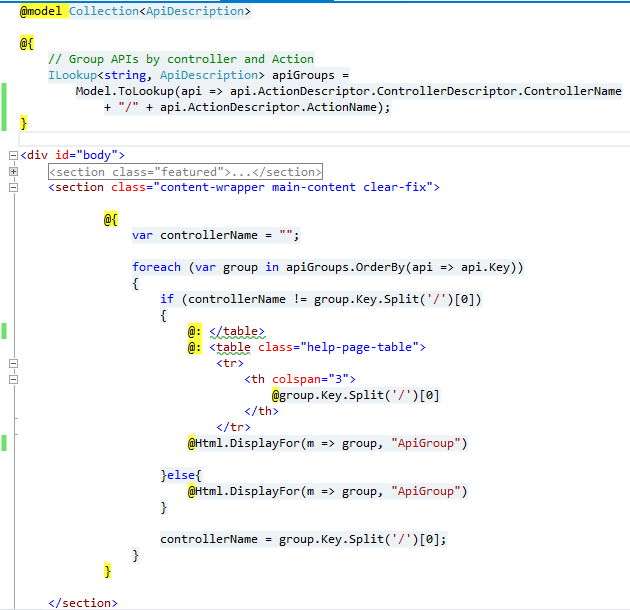 During the creation of my Web API project I had considered using a separate Controller for each unique request with the 4 standard HTTP methods available (GET, POST, PUT & DELETE). In practice however it seemed neater to consider a Controller as a business entity (e.g. Customer) and to allow for several Actions types within it. This cuts down on the number of separate .cs files needed in the project and provides a logical grouping for developers trying to navigate your API e.g. 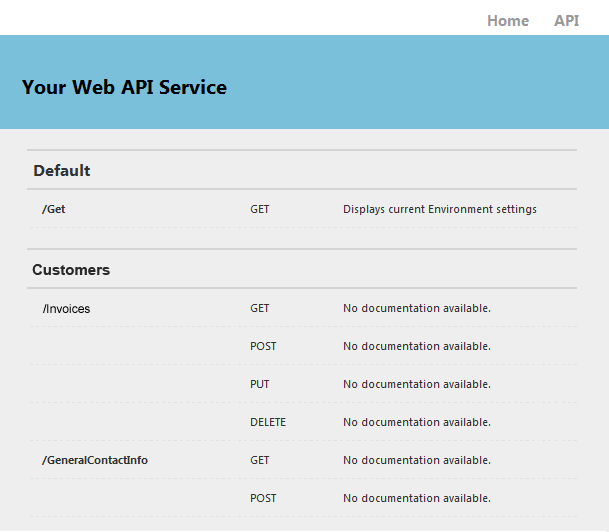 And that's all there is to it, a self-documenting REST style Web API service which can be maintained by developers, for developers - pretty neat! Nevermind again, I got it to finally work. Thanks.